'Five Heroes On Langya Mountain' is a patriotic movie based on a true story well known in China. 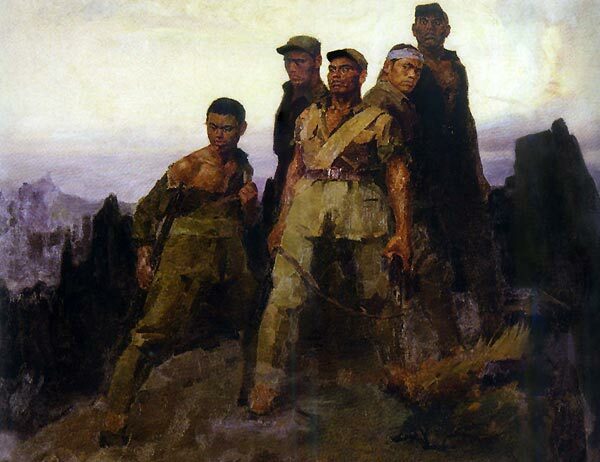 In 1941, during the Sino-Japanese war, a group of five Communist soldiers were able to deceive the advancing Japanese army and drew them up to the slopes of Langya Mountain. The Japanese, thinking they were besieging the main army, lost valuable time and troops trying to eliminate them. When the five heroes ran out of bullets, they jumped off the cliffs. Three of them died but two could hang by a tree branch, survived and could recount the story. In the mean time, the Chinese main force could escape and regroup.